Here are Some of the Best Places to Stay in Edinburgh! We love Edinburgh and you’ll need to sleep while you’re there, so we’ve decided to expand our guide to give you more travel information about Edinburgh. Whether you’re staying in Edinburgh on business, with the family, as a couple, or with friends – there’s no great way to determine the best place to stay. Often, people will start their search by asking about the best area to stay in Edinburgh. Again, not an easy answer! Whether you’re in New Town or Old Town, near Arthur’s Seat or in the West End – you’re going to find great accommodation in Edinburgh. That said, we’ve divided this post of hostels and hotels in Edinburgh into four price ranges: Hostels, Cheap Hotels, Mid-Range Hotels, and “Once in a Lifetime” Hotels. We will then tell you where it is located to give you a rough idea of where you’d be in Edinburgh! Get Started Booking Now – Click here to search for hotel deals in Edinburgh! For example, if you’re looking for hotels near Edinburgh Castle, you’re in luck – as there are many places on the Royal Mile all within walking distance. If you’re driving to Edinburgh and looking for Edinburgh hotels with parking, be sure to check the websites. Few of them do have parking – and we mention if they do in this article to make it easy for you. This post is Part 6 in the Ultimate Edinburgh Travel Series! This series has been helpful to so many travellers and we’re honoured to be able to offer up our knowledge! Check out the other posts below when you’re done reading this one. Let’s get down to finding you a place to stay in Edinburgh! Don’t let the word “cheap” scare you. There are plenty of good and reputable hotels in Edinburgh that are conveniently located in the centre of the city. You don’t have to stay in the “middle of nowhere” just to get a deal. Below are a few of the top hotels that will have you so close to the action in the New Town or in Old Town! 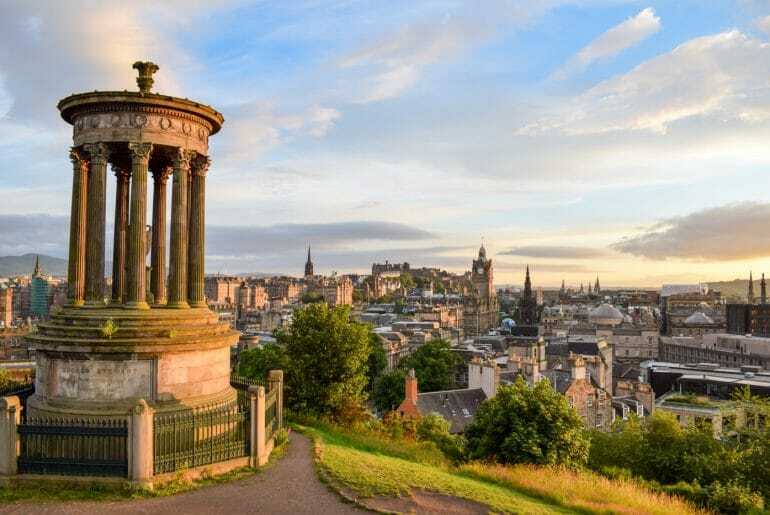 Located in the West End of Edinburgh, B + B Edinburgh is a quick walk to all the shopping on Princes Street and only a few minutes walk to Haymarket Train Station. This upscale bed and breakfast lives in an old Victorian-style house on a quieter, more residential feeling street. The modernly designed rooms have ensuite bathrooms with WiFi throughout the place – some of the rooms even have original fireplaces! For breakfast, you’ll receive a free Scottish style meal served in the old dining room. You can even relax in the bar and library-lounge which features wall-to-ceiling bookshelves. While there’s no parking, B + B Edinburgh is kid friendly and a great option for those looking for a stylish but comfortable place to stay in Edinburgh. Check the availability at the B + B Edinburgh! If you’re looking for a familiar brand in a great location, the Holiday Inn Express down on Cowgate is definitely for you. Steps from the Royal Mile, it is definitely a hotel that boasts a location great for restaurants and all the bars on Cowgate. There’s not much to say about the Holiday Inn – it’s a straightforward hotel with modern clean rooms. There’s no parking, but it’s easy to access by car. Hot breakfast is complimentary. For a cheap and clean hotel with friendly staff, the location can not be beat for hotels in Old Town, Edinburgh. Book the Holiday Inn Express for Your Trip! Don’t let the name “motel” fool you. This hotel is beautiful – and right in the heart of New Town across the street from Waverley Station. As a strong chain hotel known around Europe for its chic atmosphere and decor, this Motel One on Princes Street doesn’t disappoint! It’s a great location to keep up to date with what’s going on in New Town and the bustling shopping street below! The rooms are decorated to a modern feel with all the amenities you’d need – like a hair dryer and coffee/tea station. There’s no parking, but the location is so central in New Town that access by train or tram from the airport is a simple walk. The staff is raved about by other travellers – but see for yourself! Book the Motel One on Princes Street or check out the other Motel One location under the Royal Mile! The ibis on South Bridge is a great hotel option if you’re looking to stay in Old Town. Truthfully, it’s located right across the street from where Eric lived during his time in Edinburgh. As such, he knows about the numerous guests funneling in and out each day! The ibis is a 3-minute walk from the Royal Mile – and has a lively restaurant with live music right beside it. Each room is decorated with a modern feel that includes a TV and free wifi throughout. The ibis also has its own restaurant and lounge area for those looking to stay close. 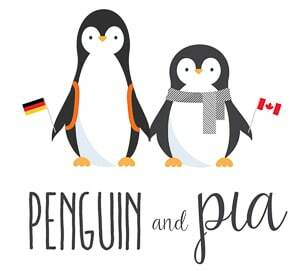 The international staff are extremely helpful, and while there’s no parking at the hotel, it’s kid-friendly. 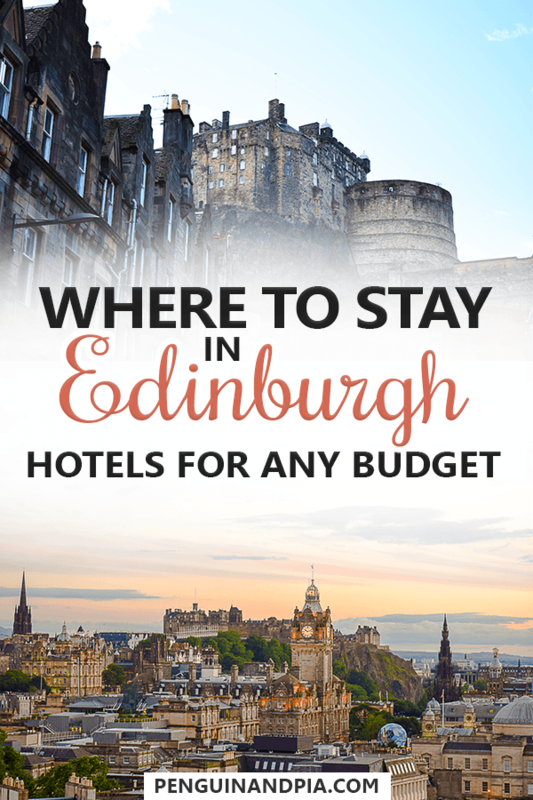 For a cheap but great hotel option in Edinburgh, book the ibis on South Bridge or check out the ibis hotel – Edinburgh City Centre which is also close by! There are A LOT of hostels in Edinburgh – and it can be tricky to choose. The ones down on Cowgate can have a bad reputation as being “rougher and rowdier” but it’s important not to group them all into that basket. That said, hostels are a great way to find a bed for cheaper and meet other travellers on the road. If that’s your style – then below we’ve listed a few of the best hostels in Edinburgh. None of them are on Cowgate. Rather, they are all up on the Royal Mile or close to the Castle. We have (or close friends have) personally stayed in all three of these and had a great experience. See for yourself! Overlooking the Royal Mile from about half way up to Edinburgh Castle, this is a hostel Eric stayed at when he first visited the city in 2015. The Royal Mile Backpackers hostel was simple and great. Because of this, it easily made our huge list of great hostels we loved all across Europe. Easy to find, with nice communal kitchen and lounge area for work or socializing. The rooms were large and dorm style with shared washrooms in the hallway. The staff were very friendly and offered tips any time of the day. Bed linens and wifi are included, with towels for a fee. There are lots of great restaurants and bars in the area – so definitely take advantage of any local knowledge. Remember, the people you meet in the hostel make great drinking/eating friends! We definitely recommend R.M.B – but go ahead and see for yourself! Check Availability at Royal Mile Backpackers with Hostelworld! This adult only hostel is right below Edinburgh Castle to the South – in between the Royal Mile and Grassmarket connected via a variety of stairs. Because Castle Rock Hostel is a hostel in Old Town, you’ll be close to all things touristy in Edinburgh. Consistently rated as one of the top hostels in Edinburgh, it’s no surprise as to why. The facilities are clean and colourful, the staff are friendly, and the vibe is friendly and social – perfect for meeting other adventurers discovering the city! Linens and wifi are included, and the hostel has a great lounge with a pool table and jukebox. The hostel organizes a variety of events and walking tours so be sure to take advantage of all there is to do. Check availability for Castle Rock here. Tucked away on a side street connecting the Royal Mile and Cowgate, the High Street Hostel is a great option for backpackers and budget travellers alike. For hostels in Old Town, Edinburgh, the location is super central. The building was constructed in 1564 – but don’t worry – it’s very safe. And definitely not haunted. The rooms are very simple but offer travellers exactly what they need – a place to rest their head. Available in private or dorm style, lockers and bed linens are included with towels for rent. Bathrooms are shared among the rooms. There’s free wifi in the lobby with coffee and tea available at all times. If you’re looking to cook, there’s a self-service kitchen, a lounge with a pool table and a quieter lounge. The High Street Hostel offers walking tours and pub crawls so it’s a great way to meet other travellers and stay in Edinburgh for cheap! Book the High Street Hostel on Hostelworld. The mid-range hotels below are, like many of the other recommendations, right in the middle of the city. These are the ones that Eric would actually walk by on a daily basis and think “ah, what a beautiful place that must be”. Spoiler: We’re talking about the Inn on the Mile, Hotel Du Vin, and The Scotsman Hotel. Eric is getting Edinburgh nostalgia so just go and have a look at a few of them! Overlooking Edinburgh Castle from lower down on North Bridge and the Royal Mile, this hotel is famous for being the former home of the Scottish newspaper bearing the same name. Built in 1905, The Scotsman Hotel definitely fits the bill when it comes to historic style and luxury. The rooms are individually decorated, and some of the highest rooms even have a view all the way to the Firth of Forth – a famous bridge connecting the city to the North in the distant West End of the city. The Scotsman’s location means you’re staying right in the action with all the best activities in Edinburgh a quick walk away. Oh, and while there’s no parking connected to the hotel, let’s not forget that there’s a spa, steam room, a swimming pool, and there’s even a cinema in the hotel! For one of the classic hotels in Edinburgh, the Scotsman is one of the cheapest – so don’t miss out. Check prices and availability for the Scotsman here! If you aren’t looking for it, you might miss The Inn on the Mile. This small hotel is located in the heart of all the action in an old bank building form 1923 – at the corner of the Royal Mile where North Bridge turns into South Bridge. This hotel boasts a lively atmosphere – with live music 6 nights of the week. You can walk by and frequently see the chic bar filled with locals and tourists alike enjoying an authentic British dinner and a few beverages. As for the rooms, the Inn on the Mile only has nine – but they are hip and cool, like the vibe downstairs. You’ll find WiFi, flat-screen TVs, iPod docks and more in each room. Bathrooms include rainfall showerheads that are sure to make your end of day routine in Edinburgh that much more relaxing. The Inn on the Mile is what seems like the crossroads of the world. If you want to stay here, check prices and availability now. Do you want to stay in the heart of New Town? With shopping outside your front door and the entire city basically as your neighbour? Great – then the Principal Hotel on George Street is for you! Built in the 1780s, this hotel is absolutely stunning from the moment you walk in. The rooms are all beautifully furnished and glowing with modern amenities like free WiFi and pretty bathrooms. The hotel is on George Street, so it’s a very short walk from Waverley Station. There are an in-house restaurant and bar which can often be busy due to their popularity with guests and locals alike. The restaurant’s popularity could also be due to the fact that they serve authentic Scottish cuisine. While there’s no parking, you can drive up to the front door with ease and meet the staff, who are apparently very friendly! But don’t take our word for it, check price and availability for your stay at the Principal Hotel! Situated in Old Town behind the National Museum of Scotland and close to the Historic University of Edinburgh, Hotel Du Vinis a beautiful hotel on what will seem like a quieter side street. If we had to choose a hotel, this would be right up there because of how close it is to things to see in the Old Town. It’s also close to where Eric used to live so he’s totally biased. Fun fact: this hotel is housed within an 18th-century asylum. Don’t worry, it’s totally safe these days. The rooms are redone to be modern and warm with beautiful bed linens. The upgraded suites have features like custom sleigh beds, balconies, and sitting areas – which is awesome. The hotel is kid friendly, and while there’s no parking at the hotel, it’s easy to get to by car. The hotel serves a traditional English breakfast for a small fee and includes a French restaurant, two bars that also serve food, and an inner courtyard where you can dine. Tucked away from all the city’s noise, Hotel Du Vin will feel like a hidden gem, so check out if there are rooms available. Picardy Place is only a short walk from the Edinburgh Playhouse, a short 8-minute walk to Waverley Station, and located basically at one end of all the shopping on Princes Street. Despite the age, the rooms are all redone to a modern finish with ensuite bathrooms, mood lighting, and soaking tubs – which will surely be helpful if you followed our one-day guide to discovering Edinburgh! The hotel houses a steakhouse, a seafood restaurant, and a cocktail bar with exposed stone walls for an authentic experience. While there’s no parking at the hotel, it’s easily accessible by car. If you want to stay here on your next Edinburgh adventure, check prices and availability now. These hotels are the cream of the crop. The best of the best. However you want to describe them, these are the places that will take care of your every need – and then some! Having photographed The Balmoral so often from Calton Hill, we’ve got a deeper connection to it. However, Eric also went to a charity black-tie gala that was hosted at The Balmoral and BOY was it fancy. Have a look at these places! Sometimes thought of as the Edinburgh Castle hotel because of its close proximity, the Witchery has been around for ages and continues to serve the city! Known for its semi-terrifying Baroque and Gothic design influences, this hotel is certainly for those looking to experience something unique during their stay in Edinburgh! The Witchery has a location that cannot be beaten for hotels in Old Town, Edinburgh. With the Edinburgh Castle steps away, the entire Royal Mile is below you – all you have to do is walk and you’ll reach shops, bars, The Palace of Holyrood, Arthur’s Seat, and more! The hotel itself features adult only rooms with free champagne and antique furnishings throughout. Many of the rooms differ – some offer the guest a fireplace, while others have a small seating area or kitchen. The Witchery does have parking, and a breakfast that is served in-room or by candlelight in the unique dining room. There’s also a restaurant known to locals and tourists alike, and a terrace which is open when it’s warmer that offers a great escape from the busy cobble-stoned street! If you’re ready to have a story to tell about your hotel in Edinburgh, book The Witchery to avoid disappointment. The dominant Victorian force in the skyline. That thing with the really big clock in everyone’s Edinburgh photos. Whatever you know it as, the Balmoral Hotel is a unique staple in Edinburgh. Situated in New Town, connected to North Bridge and Waverley Station, “The Bal” can be seen from across the city. The Balmoral features stunning architecture and a grand entrance inside, but don’t let that historic exterior fool you. Inside, you’ll find fast modern amenities like high-speed internet, marble bathrooms in-room, a luxurious spa, swimming pool, fine dining restaurant, and bar area. While there’s no parking, taking the train into Edinburgh and staying at the Balmoral would be quite the Edinburgh adventure. Check price and availability here for that hotel that Eric owes many great photos to. Let’s be serious for a second, the Radisson Collection is a 5-star modern hotel right at the Royal Mile on George the IV Bridge Street. Edinburgh Castle is a 5-minute walk up the Mile, and Waverley Station is about 11-minutes away – making this hotel right in the action of Old Town. In fact, you’ll be right around the corner from the famously photographed Victoria Street with the shops and cafes at your disposal! The bright and modern rooms have all been decorated with different colour schemes. The amenities include wifi and in-room coffee stations because everyone loves a cup of coffee or tea after a long day in Edinburgh. The upgrades rooms have larger living areas if you are looking for space. Below the rooms, you’ll find a popular restaurant that specialized in Italian. The bar is great for cocktails – and will even do a light meals if you’re in a pinch. There’s also paid parking at the hotel. If you want to stay at the Radisson Collection, check prive and availability here. Finding a Hotel in Edinburgh is Simple! You should be looking forward to your stay in Edinburgh! We hope these unique options give you a small sample of the places to stay in Edinburgh. Of course, there are dozens of hotels around the city that are sure to meet your needs. We just wanted to feature some of the most sought after hotels to make sure that you have an amazing experience in the city we both love so much! Have you stayed in any of these? We’d love to hear about your adventures in the comments below! Don’t be shy – sharing is caring!